The Pearl may be Jack's prized possession, but his boots come in at a close second. Well, he does have that magical compass. Third, maybe? Hmm, we forgot about his particular attachment to his hat. And his sword. And we can't forget the rum! Okay, so his boots may only make the top ten list, but regardless a good pair of pirate boots are essential! Every good pirate needs a solid pair of boots to get them through mutiny, duels in blacksmith shops, marooning, and the like. So if your little one is bent on parading around as an infamous pirate, they definitely need the boots. We recommend our Kid's Jack Sparrow Boot Covers. 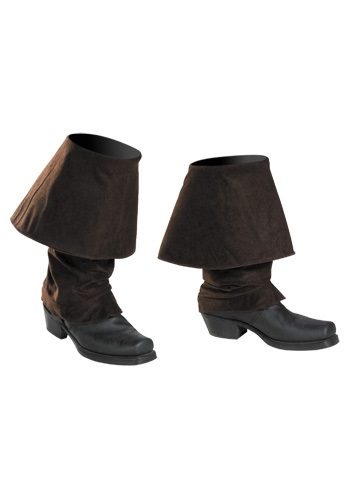 These polyester boot covers look like leather and are about 13" tall. They slide on over regular shoes to make any pair look like a pair of sea-faring boots. These will be the perfect addition to any pirate outfit. Yo ho, matey!